comments: The original version was recorded with the title "We'll understand it better bye and bye" in 1924 by Rorer Posey & The North Carolina Ramblers (Edison matrix N 455). This version was never released. Charles H. Tindley was born in 1851 and died in 1936. He wrote this number in 1905 as "We"ll Understand It Better By and By." He might have recorded the number himself, but this can't be confirmed. Tindley also wrote the song "I'll Overcome Some Day," which later became know as "We Shall Overcome." Furthermore, he wrote the gospel number "Stand By Me." Many sources imply that this is the song with which Ben E. King had a hit in the 1960s, but that was a different number. However, Elvis also recorded Tindley's "Stand By Me" for his own "How Great Thou Art" gospel collection. 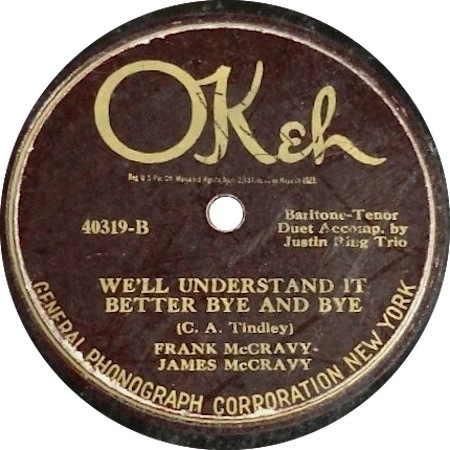 Brothers Frank and James McCravy from Laurens, South Carolina, recorded the number as "We'll Understand It Better Bye and Bye" (note the added "e"s on the words "By") in New York in February 1925, for release on Okeh 40319. This was the McCravy's first recording session, but they went on to record hundreds of tracks, often using different names, such as The Lonesome Pine Twins, The Austin Brothers, Al and Joe Blackburn, Cox and Campbell, and The Mack Brothers. They ended their recording career in 1935, by which time they had recorded "We'll Understand It Better Bye and Bye" on at least two more occasions.